Home /News, Opinion/Racial Disparities in Health — are we really post-racial? The disproportionate targeting of black and Hispanic kids is further feeding the health disparities between them and their white counterparts. According to the US Centers for Disease Control & Prevention, obesity rates for black and Hispanic youth are much higher than the rates for white and Asian youth, with roughly 26% of Hispanic youth and 22% of black youth being categorized as obese, compared to only 14% of white and 11% of Asian youth. Hispanic boys, at a 28% obesity rate, and black girls, at more than 25%, are being affected the worst. What’s worse is that the singling out of minority youth blatantly proves the continuation of racial inequality, and is disgraceful in it’s taking advantage of children’s naïve nature, as well as their families’ limited socioeconomic standing that has led junk food to be the most accessible thing. Poverty is a big factor among minorities that has led to poor nutrition. Heavily minority populated areas tend to be communities with higher poverty rates, and have fewer supermarkets that offer whole foods and fresh produce. Instead, these neighborhoods have more small grocery stores that are stocked with convenience foods: sugary beverages, chips, candy, and an array of other processed foods. This is the prevalent problem of food deserts – impoverished areas where fresh fruit, vegetables, and other whole foods are unavailable due to a lack of grocery stores, farmers’ markets, and healthy food providers, as defined by the USDA. It s further defined as an area where 33% of residents live more than one mile from a supermarket, and 20% earn salaries below the poverty line. An estimated 23.5 million people in the United States live in food deserts. And this number is likely underestimated, since the North American Industry Classification System includes small grocery stores – the convenience stores scattered throughout low-income neighborhoods carrying processed & junk foods mentioned before – in the same category as grocery stores such as Whole Foods. Needless to say, the two are completely different. Moreover, low-income, inner-city minority communities are most likely to also be food deserts. According to research done by Professor Kelly Bower of Johns Hopkins University, black and Hispanic neighborhoods have fewer large supermarkets and more small grocery stores than their white counterparts in communities with similar poverty rates. In other words, the health issue here is in fact a racial injustice, since among communities with similar poverty rates; the black and Hispanic neighborhoods were the ones more likely to be food deserts. No access to healthy foods means there is no option of eating healthy for these residents, and so their higher likelihood of developing diseases such as diabetes or hypertension (high blood pressure) – sicknesses known to affect minorities, especially blacks, more so than whites – has everything to do with the color of their skin. It must also be noted that food deserts aren’t the result of some “natural” settlement pattern. The argument that the residents of these areas chose to live where they live is deeply flawed, and the solution of simply moving isn’t attainable for most. Starting in the 1940’s, the Federal Housing Administration (FHA) began offering low-interest loans to middle-class white families, spurring the move from cities to the suburbs, otherwise know as “white flight.” Supermarkets, along with many other businesses, followed the white families to the suburbs, and that impact remains today, as food deserts, and the segregation that created them, persists. Hence, this new study and the prevalence of food deserts, evokes the question of, where do we go from here? How do we eradicate food deserts, and on a larger, more complex scale, how do we confront the racial injustice that is making black and Hispanic people more susceptible to an endless list of sicknesses due to the food society has limited them to? 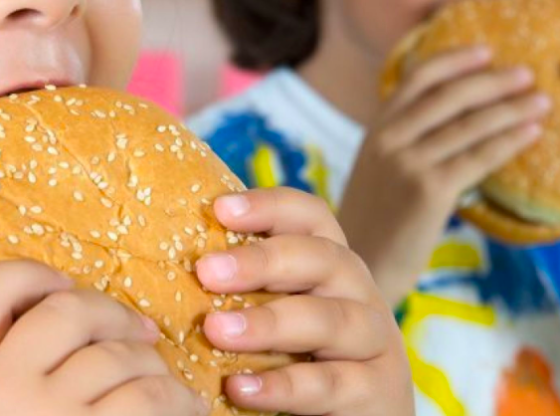 As a first step, the researchers of the study & authors of the report are urging the food manufactures found to be targeting minority youths, among which were Kraft Heinz, General Mills, Hershey, PepsiCo, Mars, Nestle, McDonald’s, & Yum! Brands (KFC, Taco Bell, Pizza Hut), to target these kids with fewer ads promoting unhealthy foods. Instead, the authors want to see these companies using black & Hispanic kids in initiatives promoting healthier habits. Whether this will be the first step in a long movement, one that is both an issue of public health & racial injustice, is seemingly up to the food manufacturers. But it is an issue in need of immediate confrontation, and one that won’t be solved right away or with a single measure. The solution involves peeling back layers of government-implemented segregation, and creating incentives for supermarkets, farmer’s markets, and the likes to locate to food deserts, and overall be accessible, physically and financially.